I’m not talking about small discounts either! 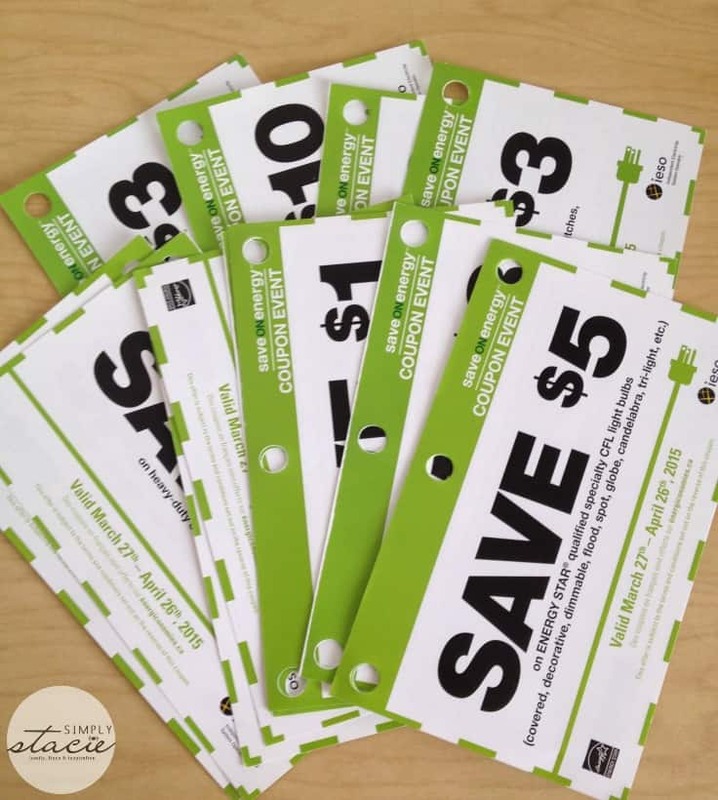 Some of the coupons are valued at $3, $5 and $10. Check out this list of participating retailers to find one in your area. You can also download the coupons online. The Spring Coupon Event is one of many saveONenergy programs offered by IESO (Independent Electricity System Operator) and local distribution companies. Their goal is to help Ontarians better manage their electricity consumption. This coupon program has been around since 2006 and since that time, Ontarians have reduced their energy use enough to power a city the size of North Bay, ON for one year. Wow! 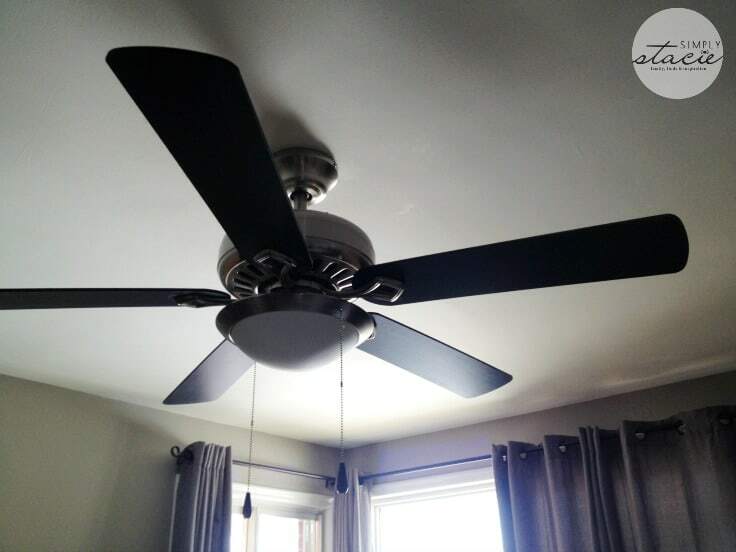 For me, I’m always looking for ways to save money and switching to energy-efficient products is on my to-do list. I’ll be finishing my home this month and taking full advantage of this coupon program. 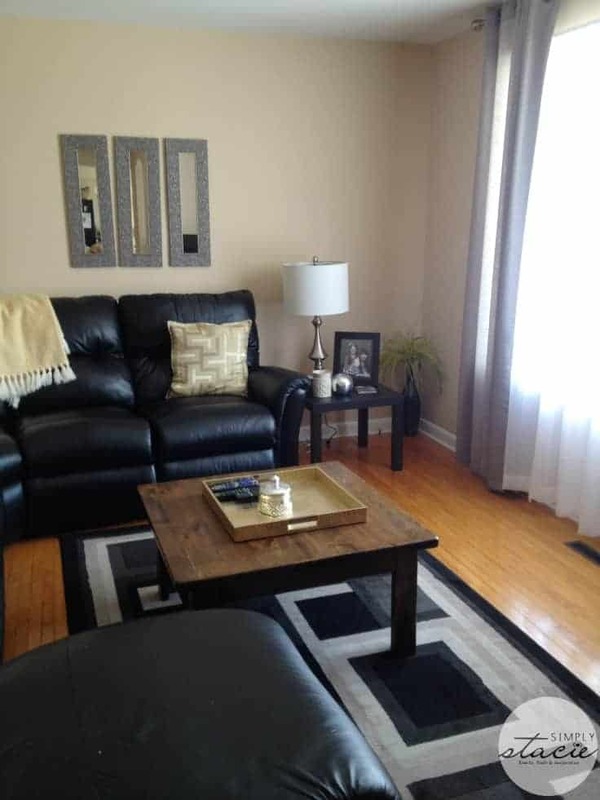 I started by replacing the light bulbs in my home with energy-efficient LEDs and CFLs. LEDs use 90% less energy and last up to 25 times longer than incandescent bulbs (with a wire filament). 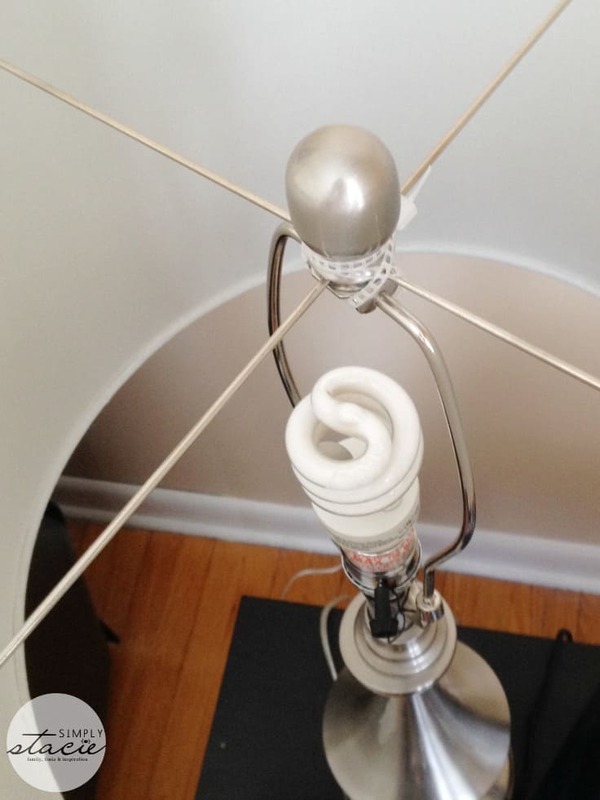 CFLs use up to 75% less energy and last up to 10 times longer than incandescent bulbs. 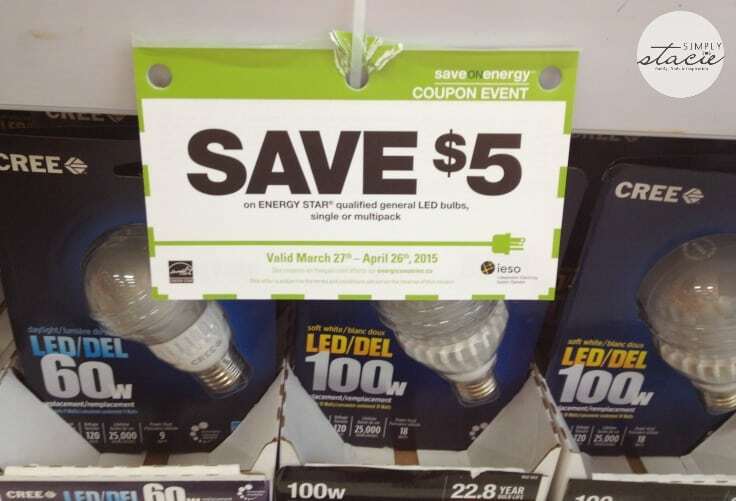 The saveONenergy Spring Coupon Event has coupons for both. Before you head out shopping, make a list of the type of light bulbs you’ll need for each of the light fixtures in your home. It can be a little overwhelming when you hit the light bulb section because there are so many options to choose from. Planning ahead will save you time at the store. I had my coupons before hitting up our local hardware store, but also noticed the signage in the light bulb aisle advertising the program. 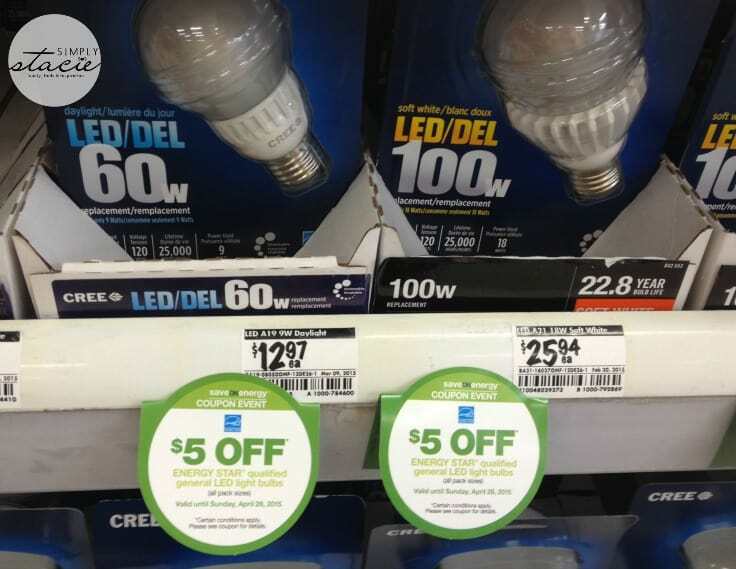 It was easy for me to find the light bulbs I needed and use my coupons. In fact, the tear pad coupons were right in the aisle so I grabbed a few more so I can come back and buy more. 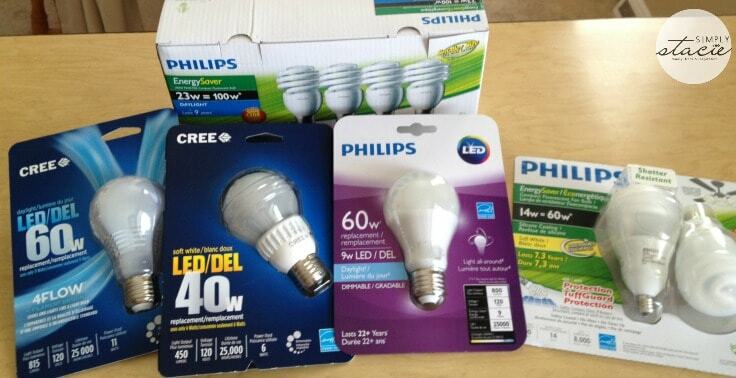 I used both the CFL and the LED coupons on my recent shopping trip. It’s not often you find coupons with that kind of savings! I’ve been working my way around my house replacing the light bulbs. My living room has two lamps and they both have energy-efficient bulbs in them. I only turn them on at night though to save money. My lamp now has a CFL light bulb. In addition to CFLs, LEDs are available in many shapes and sizes to fit a wide range of light fixtures. The cost of LEDs has come down drastically just in the last five years. In 2010, a standard A-line LED would cost $50 to $60 each. Today, you can find them as inexpensive as $7! Get them even cheaper when you use coupons. I was expecting that they would cost a lot more than they did. So if you were under the impression that it was too expensive to switch, please reconsider! It’s way more affordable today compared to five years ago. 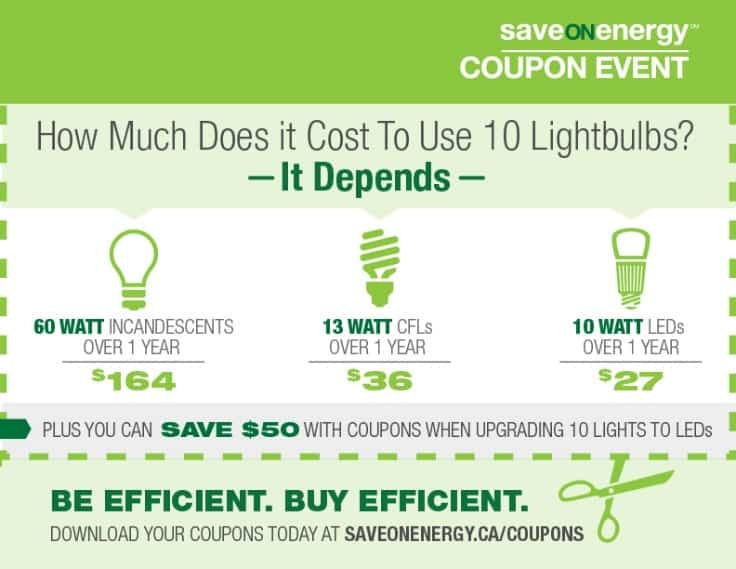 Visit saveONenergy for more tips on conserving energy and cutting down costs. Do you plan to update the light bulbs in your home to energy-efficient ones? We switched everything to energy efficient bulbs a long time ago! I have only energy efficient bulbs in my house. And a programmable thermostat. We have a programmable thermostat , are changing over our light bulbs as the old burn out and are wearing fleece in the house. Thanks for your research. We are slowly replacing our bulbs as the current ones burn out, that way we are spreading the cost of them out. Thank you for the great energy and money saving tips. I love your blog! Costco had a great prices for the light bulbs in the fall. I stocked up on them at the time and changed the ones in the most used areas in the house. I have updated all of my lights to energy saving ones because it saves a lot of money on the electricity bill! 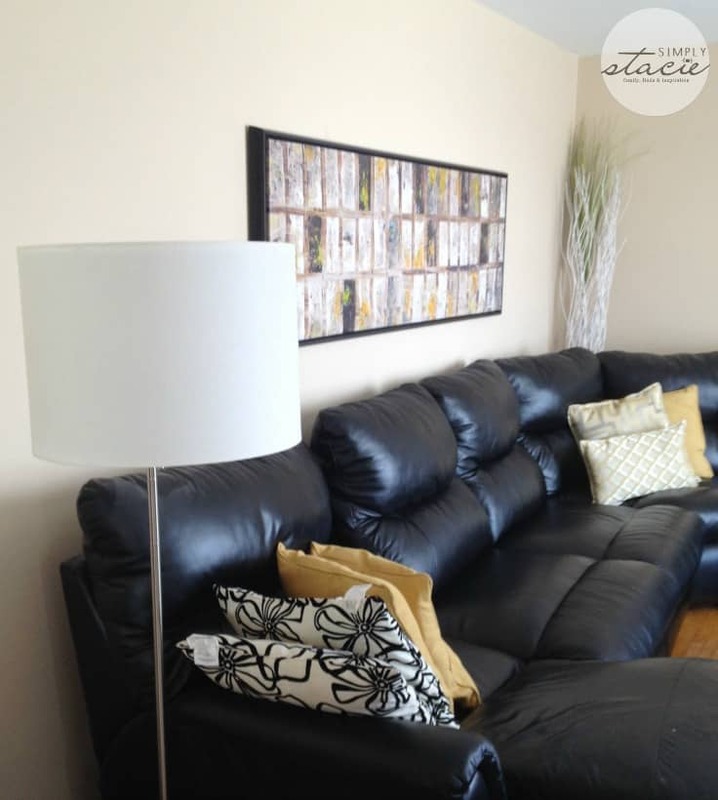 I like doing a Spring makeover in my living room with some new lamps! Great post about energy saving. Doing this in the Spring is a fabulous idea. I live in an apartment right now, but I have replaced the majority of bulbs with energy efficient ones. i love those energy efficent bulbs they last so much longer and my light bill is less !